This is from Matthew, of course, who originated the “spot the” series. 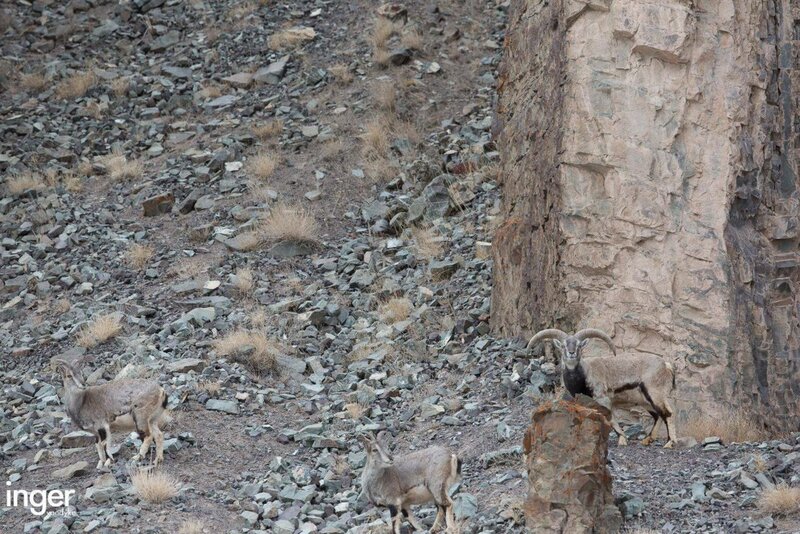 Here we have a hidden snow leopard (Panthera uncia) amidst a group of Siberian ibex (Capra siberica). Can you spot it? Answer later on today. This entry was written by whyevolutionistrue and posted on November 21, 2017 at 9:15 am and filed under felids, spot the nightjar (and other beasts), spot the ________. Bookmark the permalink. Follow any comments here with the RSS feed for this post. Both comments and trackbacks are currently closed. Yes, very hard to see. Especially since you cannot zoom in on this one. I would rate this one as pretty difficult. Ah yes. And that does make it a bit easier but still somewhat difficult. Those ibex are not looking where they should be looking! I asked myself, “if I were a leopard, where would I be?” Bingo! This is an excellent ST_ entry because the picture is also beautiful. I spotted it within about 5 seconds of my second viewing. Nobody here. Just us rocks. Spoiler: Its left eye is at (632, 258). I would be Leopard lunch. That took me about 90 seconds. Nice one! He’s very close to invisible. That’s a scene I would love to have seen in person. Very close to invisible… until he moves. An interesting genetic arms race playing off speed to attack/run away, quality of camouflage against visual acuity, patience over opportunity, alertness over grazing, and so on. Got it. But if it wanted to eat me I would be dead before I saw it. I found it eventually, but I have to admit it took a moment just to find all the ibex! Indeed, first I thought I saw it, but then I saw it clearly, just somewhat closer than my first suspicion. Took me quite a while, would have been breakfast. I can’t see him. Anywhere. You should have gone to Specsavers.